A clone console or console clone, is usually an unlicensed reproduction of an officially branded video game console. They usually exist to fund the pirate trade in an attempt to gain money off the works of other companies. It looks and plays like an Sega Mega Drive, but it's actually an Magistr Drive 2. 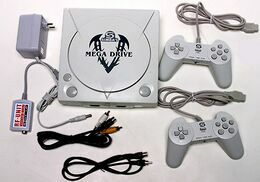 Clone consoles exist because popular video game manufacturers such as Sega or Nintendo were often slow to market their products in every region of the world. Traditionally a video game console is released in Japan first, then brought to North America, then to PAL regions such as Europe and Australia. But the world is much bigger than these regions, and it often takes months if not years for products to make it to smaller markets such as South America, Asia and Africa. Often the big companies decide against marketing their products in these places as they do not feel they can make a big enough return, or because piracy or various laws prevent them from doing so. So often local companies take it upon themselves to bring the technology to these regions, and to do so they need to manufacture their own consoles, usually based on the design of their Japanese counterparts. Though it is not technically legal to produce consoles in this way, tracking and shutting down the manufacturers can be costly, especially if the companies effected aren't competing against them. Piracy can produce some interesting results. Often clone consoles are not as restricted as official machines as they are not region locked, so games imported from anywhere in the world can be played on the system. Unusual and sometimes better designs can also emerge from the pirate market, making a clone console often superior to the official system. On rare occasions, clone consoles are distributed with pirated video games, including mutli-carts and pirate originals that are occasionally better deals than the real thing. For older consoles, there may be support for better picture technologies, such as AV instead of RF. In some rare circumstances you can find clone consoles with more realistic light gun accessories. In the west, light guns are designed to look as unrealistic as possible so as not to promote gun crime, but these restrictions do not always apply to Asian countries. Clone consoles also often have the advantage of being much cheaper than their official rivals as they cost far less to manufacture. On extremely rare occasions it is possible to find two or more consoles combined into one unit, which is obviously a much better deal than purchasing two consoles separately. There can be further advantages such as the ability to run ROMs too, and PAL region clone consoles may be able to run games in NTSC 60Hz mode rather than the slower border-heavy 50Hz PAL mode used in the early 1990s. 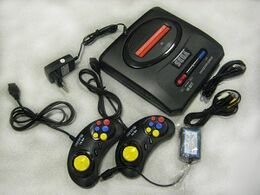 Several clones also feature portability, built-in games, and wireless controllers, such as the AtGames Sega Mega Drive line. Newer, higher-quality clones have much better reliability than old used consoles. The pin sets in the cartridge slots and the power jacks tend to be tighter, ensuring a more stable connection to prevent crashing and freezing. Clones that are sold new have no surface damage or dirty parts, further enhancing their physical appearance. As digital media becomes the standard for many users, more modern clones now support SD cards for more efficient game storage, also enabling users to play ROM hacks without the use of a flash cartridge. Unlike emulators available for PC and services such as the PlayStation Network or the Xbox Live Arcade, most clone consoles have full support for the game cartridges themselves. On the other side of the fence, clone consoles tend to be of a cheaper and poorer build quality and often do not work as they should as a result. Cloned game controllers are often unusable, as response times may be too slow, buttons may get stuck or the whole thing may shatter due to weaker plastic. Handheld systems will sometimes have poor battery life or dodgy screens, and picture and sound quality may not be exact. There are often issues with more complex add-ons such as the Game Genie or Sega Mega-CD, and some games may refuse to run. Sometimes poor quality machines will get very hot after long periods of usage, effectively destroying the console as the insides begin to melt. This is because pirate quality products don't tend to be put through any quality control testing phase. A common problem with several clones is that their controllers aren't as well-made as those found on the original console. The cords are often shorter, and sometimes the directional pad isn't lifted properly, causing certain games to be more difficult to control. Some clones, such as the Gen-X Dual Station and GN Twin, don't support the original controllers at all. A Dreamcast or a PlayStation? Neither, it's a Mega Drive V.
Some clone consoles have been freely advertised by the gaming press thanks to a lack of better alternatives, but having a high profile means the companies will be able to identify pirates quicker. Often there are numerous revisions of the same console, though it is rarely to fix design failures. Pirates will often bend the truth to sell hardware. For example, a Sega Mega Drive may be repackaged in a Sega Dreamcast shell, tricking the customer into thinking he/she has purchased a cheap Dreamcast, when they have actually bought a much older system in disguise. Mario may be plastered on the side of a Sega console's box, despite there not being any Mario games for the system. False screenshots or features may also be added to the box as there are no laws to stop them from doing so. Sega have attempted to shut down pirates in the past, but this is not always an easy task. With the aid of modern technology newer machines often have the ability to run downloaded ROMs, or have the games built-in to the console. Furthermore old patents have not been renewed, making way for a new generation of clones that don't need a license, such as the Yobo FC3 Plus and RetroN 3. The argument is often to simply track down those pirating current generation hardware, as there is little money to be made with older consoles anymore. That being said, there is still a market for retro consoles, especially those that are portable and lightweight. Sega are known for re-releasing many of their Mega Drive games via plug-in-and-play machines - very cheap pieces of hardware with a selection of built in games that are easy to hook up to a TV and don't take up as much space as their original console releases.